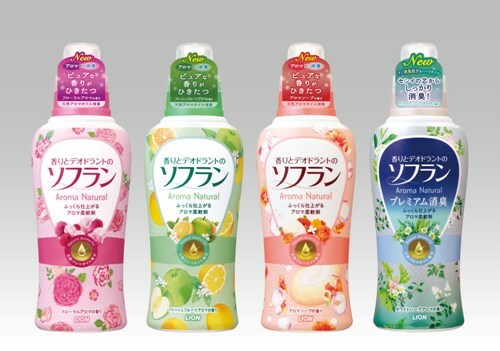 Lion Corporation (President: Itsuo Hama) announces the nationwide release of improved Kaori to Deodorant no SOFLAN (SOFLAN with Fragrance and Deodorant) Aroma Natural on September 25, 2013. This fabric softener for clothing eliminates unpleasant odors and contains natural fragrances that make doing the laundry more enjoyable. Lion is also introducing a “premium deodorizer” type containing proprietary nano-deodorizing ingredients that are extremely effective at eliminating odors. The fabric softener market is showing continuing growth, having expanded 107% in 2012 compared with the previous year (INTAGE Inc. SRI survey, fabric softener market, January-December 2012 cumulative, based on monetary amounts). A 2012 Lion survey found that while 47% of consumers said that they look for a good fragrance when purchasing fabric softener, many also prioritized effective deodorizing (36%), odor prevention (31%), and prevention of unpleasant odors from damp laundry (31%), reflecting growing demand for odor care. Lion’s clothing fabric softener Kaori to Deodorant no SOFLAN (SOFLAN with Fragrance and Deodorant), blended with natural aroma oils, has received favorable reviews for making laundry more enjoyable. This product has now been reformulated with a higher content of natural aroma oils, and will be rereleased under the name Kaori to Deodorant no SOFLAN (SOFLAN with Fragrance and Deodorant) Aroma Natural. In addition, Lion is introducing new Kaori to Deodorant no SOFLAN (SOFLAN with Fragrance and Deodorant) Aroma Natural Premium Deodorizer, with superior odor elimination thanks to Lion’s proprietary nano-deodorizing ingredients. The new lineup allows users to enjoy natural aromas in a wider variety of laundry situations, offering both the fragrance line, which allows users to enjoy pure fragrances, and the deodorizing line, which is highly effective in eliminating odors. Lion continues to provide ways to make daily laundry more enjoyable. The newly introduced premium deodorizer type contains nano-deodorizing ingredients that penetrate deep into fibers to effectively remove odors caused by sebum and sweat. These ingredients also help reduce odors generated while clothes are being worn, for a long-lasting just-washed feeling of cleanliness. Users can enjoy its fresh, clean “white herb” aroma, formulated from deodorant fragrance ingredients that are highly effective in eliminating odors. Lion has increased the content of luxurious natural aroma oils used in the Floral Aroma, Fresh Fruit Aroma and Aroma Soap fragrances, which have been well-received by consumers. These oils help to eliminate unpleasant odors and provide an enjoyable fragrance. New package designs use soft watercolor illustrations to invoke impressions of pleasant fragrances. Nano-deodorizing ingredients penetrate to the core of clothing fibers to effectively remove even odors caused by sebum and sweat. These ingredients also ensure a long-lasting just-washed feeling of cleanliness even while clothes are being worn. Formulated with an invigorating herb fragrance.